As part of Just4Keepers CIs strive to promote goalkeeping in the Channel Islands, we are spending 5 mins with various goalkeepers – past & present, to give us there thoughts on all things goalkeeping. We hope you enjoy and should you wish to be part of this Q&A email Matt at mattelcock@just4keepers.co.uk. This month we hear from Garry Lloyd – former goalkeeper with Grouville FC and Jersey FC, current goalkeeper for St Ouen FC and coach with Grouville Minis. 1. How old were you when you started playing in goal and what was your first team? I have played in goal since I was 5 years old although always liked to think of myself as a striker. 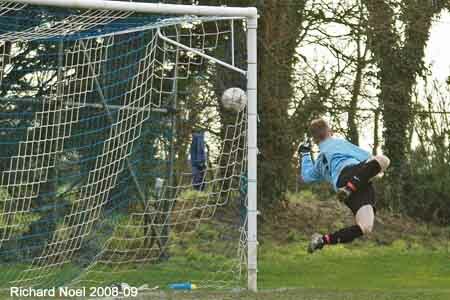 However, I always knew goalkeeping was my best position. 2. At what age did you first receive specialist GK coaching? And do you believe this is important for young goalkeepers? I was 13 and asked for a trial at Burnley. I went on to train with them for a number of years but before that it was literally just the ball smacked at me by a parent or a sub. 3. What teams have you played for during your career? I started playing for Walcott aged 8 and then my Dad began running teams so I was with him until the age of 13 when I was unable to play grass roots football due to my Burnley connections. Played with school at all levels and also represented counties and Jersey at senior level. 4. Who was your favourite GK growing up and why? Neville Southall – no words required, simply the best goalkeeper to ever live. Peter Schmeichel came close at one point but there will only ever be one Big Nev! 5. What is your most memorable moment from your career? I’ve been blessed to win a fair few trophies but assisting St Ouens in winning their first ever major trophy last year was a pretty nice thing. I saved 5 penalties during the cup run too. 6. What advice would you offer to any young GKs from the Channel Islands? Train, train and train. Living in Jersey you are at a serious disadvantage with being unable to showcase your talents to the big clubs. Jersey needs to do more on that but I can’t see that anytime soon. So, whilst they can’t help, help yourself. Train every day, practise weaknesses and more importantly, make the most of every opportunity.